Home of the Peak District National Park, Derbyshire has some of the best campsites in the UK and is a fantastic holiday destination. If you want to experience the great outdoors and revel in the glorious English countryside, it’s hard to beat Derbyshire. The rolling landscapes of its dales merge into the mountains of the north, with spectacular views and excellent footpaths across it all. 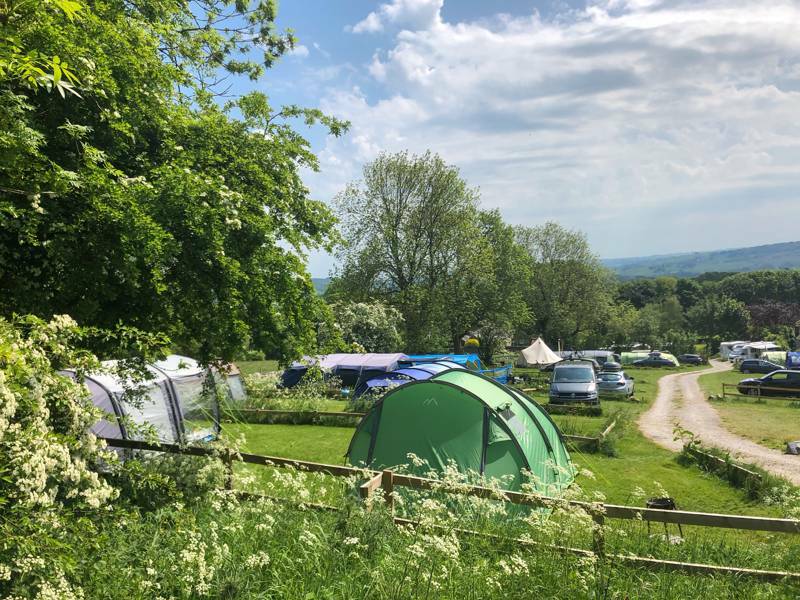 We’ve hand-picked the best campsites in Derbyshire, ranging from luxury glamping in yurts and tipis, to traditional campsites in riverside meadows. Just south of the Peak District National Park, the pretty Derbyshire town of Ashbourne is perfectly placed for walkers and cyclists on the Tissington Trail and is also hemmed in by the beautiful hills of the Henmore Valley. Find the best local campsites in the area with this prized shortlist from Cool Camping. The Derbyshire town of Bakewell – the only market town in the Peak District – makes the perfect centre-point in the national park and the ideal base for a camping holiday. Find the best Bakewell campsites here, with Cool Camping's curated collection. The Derbyshire town of Buxton is both outside of the Peak District National Park but also at the very heart of it. Almost entirely surrounded by the national park boundary and on the dividing line between the Dark Peak and White Peak areas, the place is an ideal base for hikers, bikers and campers. 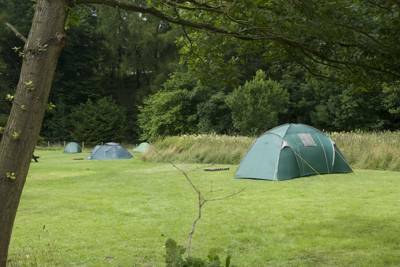 Find the best local campsites near Buxton, with our curated Cool Camping short-list. Fed by the River Derwent, the vast waters of Carsington Reservoir provide a major leisure area in Derbyshire, with sailing, kayaking and boating of all kinds bringing family fun to the water. A short drive from the Peak District National Park, Carsington Water provides some aquatic fun to outdoors holidays that may also involve hiking, biking and rock-climbing, as well as, of course, camping. The county capital of Derbyshire isn't exactly known for its camping. But, set on the banks of the River Derwent, Derby is central and well placed for venturing out into the surrounding landscapes – the Trent Valley to the south, the Peak District National Park to the north. Nearby there are plenty of good campsites to choose from. The Dovedale Valley is considered a bit of a camping Mecca in England. All around the White Peak area of the Peak District National Park unfurls in all its glory, while, in the valley bottom, the River Dove flows towards National Trust-owned Ilam Park. At the southern end of the Pennine Way and within hiking distance of Kinder Scout, the pretty village of Edale is a walker's (and camper's) delight. Find the best campsites near Edale here. A post office, a shop, a cluster of good pubs and a cluster of good campsites... what more could you need for a camping holiday in the heart of the Peak District? The pretty village of Hathersage makes an ideal base for hikers, bikers and rock climbers. Find the best campsites in the area here. Set beside the River Noe in a beautiful Peak District valley, the jubilantly named village of Hope sits in the very heart of the national park and is an excellent base for hikers, bikers and, of course, campers! On the banks of the River Derwent and at the foot of the famous Ladybower Reservoir, the Derbyshire village of Hope Valley is in the prized position for those wanting to see the best of the Peak District National Park. With so much to do on the doorstep, the local area is home to a host of excellent campsites and, as always, we've picked out the very best. Considered the gateway to the Peak District National Park, the Derbyshire town of Matlock is a hive of activity and offers excellent access to the hills for hikers, bikers and outdoors enthusiasts. Unsurprisingly, then, there are plenty of excellent campsites nearby, that provide the best of the national park, as well a quick route into the town's delights. The Peak District National Park covers a huge part of The Midlands and is where you’ll find some of the best campsites in Derbyshire. It’s high gritstone edges, heather uplands, rivers, footpaths and bike trails attract outdoor lovers from all over. And camping offers adventurers of all types the perfect way to stay as it puts you in among the beautiful scenery you’ve come to enjoy. There are campsites near natural landmarks like Stanage Edge, Mam Tor and Kinder Scout and campsites near man-made attractions too – like Chatsworth House and the market town of Bakewell. Where you choose to pitch your tent or lay your head, will depend on what you want to do while you’re in Derbyshire. Climbers and cavers will probably want to head north, pedallers and paddlers might be more at home in the south while walkers and sightseers can take their pick. Derbyshire's location, in the centre of the country, makes it more accessible to more people than some of the UK’s other outdoorsy destinations. This means it's as good for a weekend camping trip, and a quick injection of adventure, as it is for a two-week summer holiday where you get to explore more. Having been a base for all things outdoors for decades, Derbyshire has plenty of traditional campsites. There are no-frills farm-based sites across the Peak District which are perfect for pitching a tent. Often these are places where nothing but a drystone wall separates you from the footpaths and cycle trails of the national park. We love the freedom of classic camping which put you at the heart of some of England’s most beautiful countryside without leaving a lasting impression on it. Back-to-basics camping is just about the greenest, cheapest and, in our opinion, most enjoyable way to holiday. It suits the ethos of the national park movement which is all about protecting and promoting our most important landscapes. The Cool Camping team only give the thumbs up to campsites that we think our legion of fans will love. They tend to be smaller sites with independent charm – whether that’s through an incredible location alone or a flair with the facilities which are on offer. Some of the sites we choose will have little more than a water supply and basic facilities and some will have electric hook-up, hot water and extra amenities to make camping stays special. 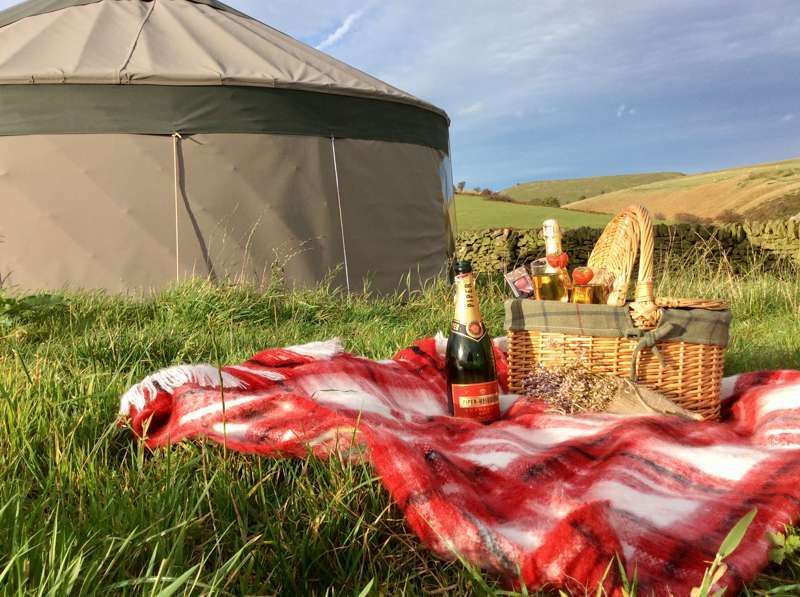 If you want to experience the outdoors but don’t fancy compromising on comfort, glamping in Derbyshire and the Peak District offers you the best of both worlds. Rather than plumping for a B&B in town, why not try a shepherd’s hut, safari tent or yurt? You’ll have the freedom of camping without having to pitch or pack a tent. 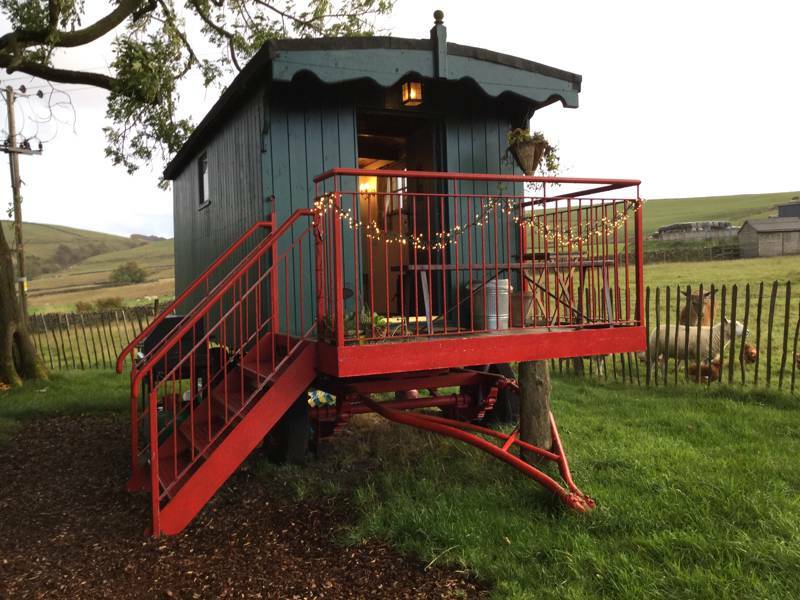 As with the rest of the country, glamping in Derbyshire has been on the up-and-up in recent years and there’s a great choice of places to stay. We take just as much care in choosing glamping accommodation for the Cool Camping collection as we do with traditional camping sites. That means you can rest assured that whether you fancy staying at a simple bell tent site or a place with bells, whistles and hot tubs, if you book with us, the site will have had the approval of our team of travel experts. 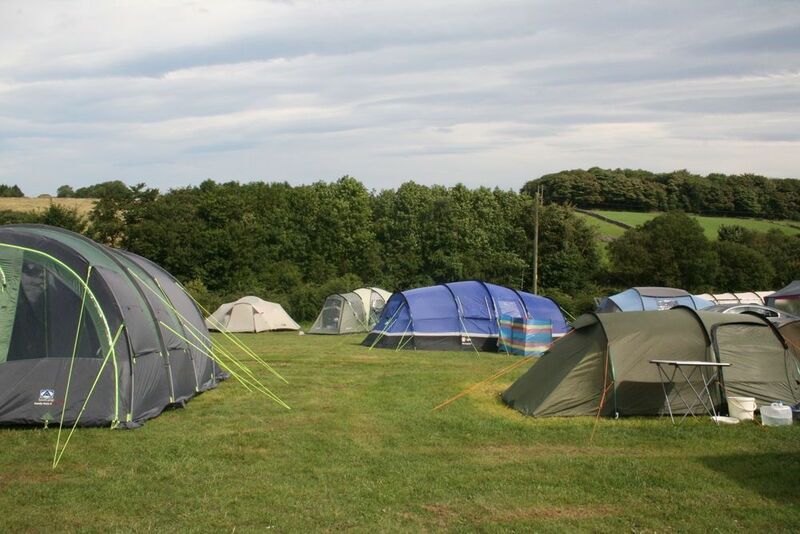 Camping is a great way to holiday with kids and family-friendly campsites in Derbyshire are easy to come by. Here at Cool Camping our idea of a family campsite isn’t one with a kid’s club and entertainers. We look instead for places where children are welcome and where there are things for them to do. Sometimes it might be that there’s a kid’s play area on site but sometimes it’s a bit more rustic than that – a stream to splash in, a patch of grass to kick a ball about in or woods to den-build in. It’s our experience that children will make the great outdoors their playground and campsite life gives them the freedom to do that. Camping and glamping sites where cars are parked away from the camping area are especially good for families with younger children and places with noise curfews can be a blessing when it comes to bedtime. We know that for lots of people there’s a four-legged member of the family too so the Cool Camping collection also features sites which are dog friendly. And if you’re camping as a couple or a group of grown-ups, Derbyshire is still a fantastic destination. Serious walkers, cyclists and climbers can enjoy long days in the outdoors before settling around the campfire for dinner. The type of campsites we choose usually offer larger pitches so, hopefully, you’ll have plenty of space but if it’s a really quiet base you’re after you can look through our adults-only campsites in Derbyshire too. The Peak District was the first of Britain’s 15 national parks, designated back in 1951. It was an appropriate place for the national park movement to start as it was here, almost 20 year earlier, that 400 ramblers had trespassed en masse at Kinder Scout protesting for the “right to roam” in open countryside. It was this action which set the wheels in motion for the eventual creation of the National Parks Authority and the Peak District National Park. It’s the heather moorland, gritstone edges and limestone dales that make the landscape here so special and there are more than 550 miles within the boundaries of the park. Within it, there’s open access land and hundreds of miles of footpaths, cycling routes and bridleways which make it easy to explore. The Peak District is roughly split in two by the beautiful Hope Valley. North of here is known as Dark Peak where peat bogs and gritstone contribute to a wilder feel. This part of the national park is on the southern edge of the Pennines and is less populated than the south. It’s a great place for serious hiking and climbing with the four-mile gritstone escarpment of Stanage Edge a magnet for climbers. The upland plateaus of heather moorland here include Kinder Scout – the scene of that 1932 protest. From the Hope Valley to the park’s southern boundary and beyond are the Derbyshire Dales. Also known as the White Peak, this landscape is more rolling hills, lush green dales, or valleys, and farmland. Here, there are limestone plateaus and gorges where rivers have eroded the rocks. At Dovedale in the southern part of the park, you can walk alongside the River Dove before crossing it on its famous stepping stones. It’s the force of water that has resulted in the formation of one of the Peak District’s other natural wonders too – its caves and caverns. There are plenty of cave systems within the national park – some which are open as show caves to the public and others which can be visited on a caving or pot-holing trips. Both in and outside the national park are towns, villages and locations you might want to visit or camp near. There are plenty of picturesque villages within the Peak District National Park but only one town, Bakewell. Its legendary puddings, shops, services and pretty location on the River Wye are a magnet to visitors. As a result, it’s well set-up to receive them and makes a great place to visit during any camping holiday. 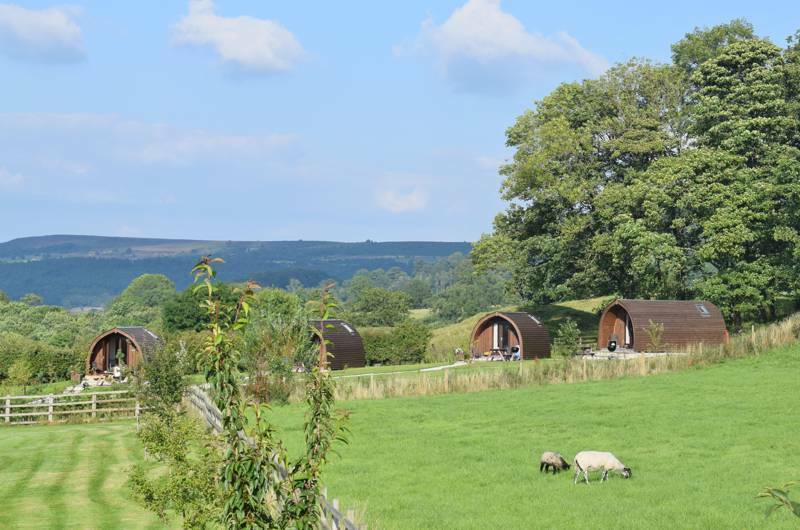 There are also some excellent camping and glamping sites near Bakewell which make a convenient base camp for any Peak District explorer who doesn’t fancy straying too far from civilisation. Bakewell may be bustling in summer but it’s hardly a place of urban sprawl. Nonetheless, if you’ve come to get away from it all and prefer to be near a footpath than a food outlet you might want to head for campsites right out in the countryside. For a base with easy access to the rugged north part of the park, try the villages of Edale and Hathersage or the pretty Hope Valley. In the southern part of the park, Dovedale is a popular place to visit and camp near with excellent walking and the famous stepping stones crossing the River Dove. Historically one of the most popular destinations within Derbyshire, Buxton, is a town that is surrounded by the national park but outside its boundaries. Made popular as a spa resort in the 18th century, Buxton has many elegant buildings and a genteel feel with a great crescent of Georgian architecture and neatly-manicured Pavilion Gardens. Camping near here can make a convenient base as it’s well connected both inside and outside the park. Also outside the park, the market towns of Ashbourne and Matlock are considered its southern gateways. Both offer easy access from The Midlands and the South and each is a destination in its own right. Matlock has plenty of attractions including the Heights of Abraham county park and cable cars, the National Tramway Museum and a station on the scenic Peak Rail heritage railway. Ashbourne is a smaller and quieter market town where you can enjoy eateries, antique shops, and more than 200 listed buildings all within hiking distance of Dovedale. Between Ashbourne and Matlock is Carsington Water, a reservoir with watersports and an RSPB reserve. When it comes to camping in Derbyshire, you’re unlikely to run out of things to do. Whether it’s walking, cycling, horseriding, climbing, caving, sightseeing or just the joy of camping that’s brought you here, a great place to start is by visiting one of the Peak District National Park visitor centres. Located in the tourist hubs of Bakewell, Castleton, Edale and Upper Derwent, each can offer the lowdown on the best places to head for within the park. They can point out the best walking routes in any area but top of our list would be hikes up Mam Tor, across Kinder Scout, along Stanage Edge and around Dovedale. If you’re in the mood for a longer walk, how about stepping out on the Pennine Way which starts in Edale? Okay, so the 267-mile route along ‘England’s backbone’ is probably not one to set out on unprepared but you could follow a section of the route for starters. The Peak District has a few family-friendly, traffic-free routes which are suitable for walking, cycling or horseriding too. The Monsal Trail is one which follows the route of a railway which once linked Buxton and Bakewell. Perhaps the best-known, and certainly the biggest, tourist attraction in Derbyshire is Chatsworth House, seat of the Duke of Devonshire and part of a huge county estate. Derbyshire has many more stately homes which are now open to the public including medieval Haddon Hall on the outskirts of Bakewell. You can go underground at The Blue John Cavern or Speedwell Cavern near Edale and find out more about industry underground at The Peak District Lead Mining Museum in Matlock. This market town is also close to the Heights of Abraham Country Park and Gulliver’s Kingdom theme park – which should keep younger kids amused. For more inspiration on things to do in Derbyshire take a look at the Visit Peak District & Derbyshire website. Derbyshire at Campsites in Derbyshire, Derbyshire is not short of campsites. From luxury glamping yurts, campervan pitches and campsites to pitch your tents at, you’re sure to find a campsite you like the look of. Read on and discover what camping in the Derbyshire has in store for you.